Please join me in welcoming the romance author, Kae Elle Wheeler to Conversations today! 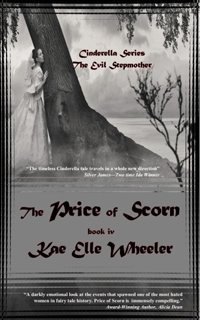 Kathy is here to talk about the fourth book in her Cinderella series, The Price of Scorn. So be sure and check out the cover, blurb and excerpt below! And don't forget to check out her bio too and get to know Kae. Did you ever wonder why Cinderella’s Evil Stepmother was so vile? So mean? Fourteen years after Prince Charming and Cinderella are crowned as Chalmers King and Queen, Cinderella, Pricilla and Esmeralda gather at their mother’s deathbed. Lady Hildegard Roche has nothing but resentment and scorn for the stepchild who culminates all that was stolen from her. Stunned silent, the sisters learn how tragedy shaped their mother into the woman she became. The question is: Can the sisters forgive her? Finding his mysterious princess by trying her glass slipper on every maiden in Chalmers Kingdom sounded like a brilliant scheme until the silly thing slid quite easily on the foot of the wrong girl. Now how is Prince Charming supposed to find his true love? Unbeknownst to either, his mother, the queen and her feisty twin (Cinderella’s infamous fairy godmother) have a lesson to impart—impulsive decisions, do not a future king make! Lady Pricilla is a modern woman. Marriage and children? Hah! She has brains and intends to use them. But Sir Arnald is different. Isn’t he? And how will they survive when they discover villains embroiled with smuggled goods and danger? Delusions of grandeur? Happily-ever-after? Lady Esmeralda is destined for life with a fluttering eye syndrome—a deterrent to any prospective intended. Alessandro de Lecce’s efforts to save Chalmers Kingdom and future heir are nil without Lady Esmeralda’s assistance. There is more to this fluttering-eye miss than meets the . . . eye! She started past the railing to reach the servants staircase where she could view the foyer. Papa was yelling at Maman. Not so unusual in this particular household. The duc must have departed because Papa would never dare speak to Maman so plainly with a guest in residence. Relief filled her along with a twinge of guilt. There was no choice in leaving Maman to her fate. But Maman had told Hilda in no uncertain terms, her place was with Papa. If Papa had any inkling Hilda had given her most precious commodity to Pierre Tasse, he would kill her lover without remorse, and beat her to a bloody pulp. She moved quietly along the carpeted hall. “Why are you telling me this now?” Papa roared so loudly the paintings on the wall seemed to tremble in fear. But Hilda knew it was she who was trembling. On stealthy feet and hugging the wall, she crept closer. There was no other way to gain her freedom save leaping from her balcony. Even Juliet had not jumped to her death in that particular fashion. That line of thought sent a shudder of terror over her. We are not lovers destined to death, she reassured herself. All she need do was make it to the pond. Off Papa’s property. Then out of Alsace to the safety of Grenoble, all within the arms of Pierre. ’Twill be over soon…’twill be over soon…soon. If she kept repeating the words, they would come true. Wouldn’t they? She slipped by the clock—a monstrosity—though she rather loved the overbearing piece of wood at the moment. “You,” Papa spat. Hilda froze, squeezing her eyes shut. “You are responsible for her recalcitrant nature.” The menace from the foyer rose like a poisonous haze that rent the air. The breath rushed from Hilda’s body leaving her trembling like the leaves she’d heard stirring from her balcony. She chanced a peek below. Her father’s large form hovered, a threatening force over Maman’s slight one. “Léonce, please—” But Papa’s meaty fist shot out cutting her off…. Kathy L Wheeler (Kae Elle Wheeler), born in Presque Isle, Maine, actually grew up in Dallas, Texas area. She migrated to Boulder then Longmont, Colorado and graduated from the University of Central Oklahoma with a BA focus on Management Information Systems and vocal music minor. Kathy writes historical and contemporary romance. She an active member of the Oklahoma Romance Writers, loves the NFL, holds NBA Thunder season basketball tickets, adores musical theater, reading and writing—and just to round things out—karaoke. Besides belonging to her local RWA Chapter, OKRWA, Kathy belongs to other chapters of the national organization as well: The Beau Monde and DARA. 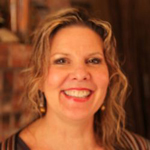 Kathy lives in Edmond, Oklahoma with her musically-talented, attorney husband, Al. They have one grown daughter (who just had a baby) and one bossy cat, Carly, who acts as if she was the rescuer rather than the rescue-ee!